The folate deficiency can result in irreversible health damage, such as the neural tube defects. The aim of this article is to determine the folate intake of pregnant women in Vale do Jequitinhonha, Minas Gerais state, Brazil, one of the poorest regions in the world. A descriptive, cross-sectional study was done in 2013 with 492 pregnant women attending the basic health units run by the public health service (Sistema Único de Saúde, SUS) in 15 municipalities. A standard questionnaire was used to gather the data, which included socioeconomic indicators and a food frequency questionnaire. The data were analyzed and compared statistically based on prevalence ratios and 95% confidence intervals. The prevalence of inadequate folate intake was associated with some socioeconomic factors: it was higher amongst the low income and less educated women, in younger women and those who had fewer meals per day. The prevalence of inadequate folate intake in the diet was 94.7% when the contribution of food fortification was not considered, 49.2% taking into account fortified foods, and 17.1% considering food folate, fortified foods, and supplementation with folic acid. We conclude that fortifying foods with folic acid at the current levels reduces the inadequacy of folate intake in the diet, but not enough to assure safe levels and to meet the nutritional requirements of pregnant women in Brazil. Key words: Folic acid, neural tube defects, Brazil. A deficiência de folato pode acarretar prejuízos irreversíveis como os defeitos do tubo neural. O objetivo deste artigo é determinar o padrão de consumo de folato por gestantes no Vale do Jequitinhonha, Minas Gerais, Brasil, uma das regiões mais pobres do mundo. A pesquisa descritiva do tipo transversal foi realizada com 492 gestantes atendidas em Unidades Básicas de Saúde do SUS em 15 municípios do Vale do Jequitinhonha no ano de 2013. Para a coleta de dados foi utilizado um questionário padronizado, que inclui um questionário socioeconômico e inquérito de frequência alimentar. Os dados foram analisados e comparados estatisticamente através de razão de prevalências e intervalo de confiança de 95%. A prevalência de consumo insuficiente de folato mostrou-se associada com alguns fatores socioeconômicos: foi maior em gestantes com baixa renda, de baixa escolaridade e em gestantes mais jovens e que realizavam menos refeições por dia. Observou-se que a prevalência de consumo insuficiente de folato na dieta foi de 94,7% desconsiderando a inclusão de alimentos fortificados, 49,2% considerando a dieta com alimentos fortificados e 17,1% considerando a dieta, a fortificação e a suplementação medicamentosa com ácido fólico. Conclui-se que a fortificação de alimentos com ácido fólico nos níveis atuais reduz a inadequação do consumo na dieta, mas não é suficiente para suprir as necessidade e garantir os níveis seguros da oferta deste nutriente entre gestantes brasileiras. Palavras chave: Ácido fólico, defeitos do tubo neural, Brasil. Folate is an essential micronutrient necessary for the normal metabolism of the organism. Its deficiency can result in irreversible health effects. The population groups most prone to folate deficiency are pregnant women, pre-school-age and school-age children, breastfeeding women and female adolescents. In these groups there is an increased pace of cell growth and development, resulting in higher folate requirement (1, 2). During pregnancy, folate is important for the increased growth of red blood cells, the expansion of the uterus, the growth of the placenta and the fetus, and the prevention of preterm births. Folate deficiency could be associated with complications during pregnancy, including hypertension syndrome, hemorrhaging, miscarriages, and cardiovascular diseases (3). However, folate deficiency is most often cited as the primary risk factor for neural tube defects (NTDs). NTDs are among the most significant congenital causes of morbidity and mortality, occurring in 300,000 newborns each year worldwide (4). They are caused by the abnormal closure of the embryonic neural tube around the 22rd to 28th day after conception. The resulting structural defects occur anywhere along the neuraxis and often lead to the exposure of neural tissue. Children with NTDs may have paraplegia, neurogenic bladder, urinary tract infections, renal failure, hydrocephalus and kyphoscoliosis, to name just the most severe or frequent manifestations (5). Genetic factors are associated with the causes of NTDs. These include simple gene mutations like Meckel syndrome and chromosomal abnormalities such as trisomy 13 and 18, and polymorphisms of genes associated with folate metabolism, such as the gene associated with methylenetetrahydrofolate reductase (MTHFR) (6). Folic acid prevents NTDs because it is a source of carbon for nucleotide synthesis and a variety of methylation reactions. Reduced levels in the organism are associated with a build-up of homocysteine, which in turn produces an enzymatic alteration in MTHFR, causing NTDs (4, 7). The serious nature of neural tube defects and the associated morbidity and mortality makes it even more important to assure adequate folic acid intake by improving the diet, fortification and/or supplementation with this vitamin. Studies show that the extra intake of folic acid in the periconceptional period reduces the risk of occurrence and recurrence of NTDs by 60% to 70% (7). Folic acid supplementation prior to pregnancy has been recommended since 1992 (8, 9). The Institute of Medicine’s daily recommended intake of 600 μg is often hard to achieve with a natural diet (without fortified foods), which supplies around 250 μg/day for a total daily energy intake of 2,200 Kcal (2). In response, in 2002 the Brazilian Ministry of Health established the mandatory fortification of wheat and maize flour with iron and folic acid to prevent the occurrence of anemia and neural tube defects, through Anvisa resolution RDC 344. This resolution determined that every 100 g of flour must contain 0.15 mg folic acid, and negotiated an 18 month adaptation period with the industry, which expired in June 2004 (10). Little research has been done into the effect of folate intake by Brazilian women during pregnancy. The studies done in the 1990s and in the first decade of this century show a prevalence of inadequate folate intake by pregnant women around 60-80% (11-13). A study into the food consumption of pregnant adolescents by a prenatal center in Fortaleza found that their diets were poor, containing less than 70% the recommended folic acid intake, based on the Institute of Medicine reference level (14). However, most of these studies have been done in the south-east of Brazil. Studies in poorer parts of the country are scarce, and very few have been done since wheat and maize flour fortification became mandatory in 2004. This is why it is important to ascertain whether the average intake is raised enough by flour fortification with folic acid to effectively increase the supply of folic acid and consequently result in lower prevalence of neural tube defects. This article aims to evaluate the intake of folate by pregnant women from Vale do Jequitinhonha, one of the poorest parts of the world, nine years after the mandatory fortification of flour with folic acid was introduced in Brazil. The aim is to ascertain whether folate consumption levels are adequate and what are the main sources of the folate consumed, as well as its associated factors, providing inputs for public policies designed to reduce NTDs in such vulnerable population groups. This was a cross-sectional study of pregnant women receiving prenatal care at basic health units in 15 municipalities in Vale do Jequitinhonha, Minas Gerais, Brazil. Vale do Jequitinhonha covers 14.5% of the area of Minas Gerais state, and 29 of the 80 municipalities in the region record their deliveries in the Hospital Information System run by the public health service (Sistema Único de Saúde, SUS). The sample size was calculated considering the total of 12,500 deliveries registered in 2010 in Vale do Jequitinhonha (15) and an expected prevalence of 30%, calculated from the average of three studies done in Rio de Janeiro (1, 11, 12), a confidence limit of 95%, and an acceptable error of 4 percentage points. As such, the minimum sample size for this study was calculated as 485 pregnant women. The field study was done at basic health units from 15 municipalities selected because they had an average of one delivery a day, or 30 a month, in 2012. Together, these municipalities comprise 78% of all the region’s deliveries. Two to nine health units were selected randomly from each municipality for inclusion in the study. The inclusion criteria for the study were women in the third trimester of pregnancy and residents in one of the 80 municipalities in Vale do Jequitinhonha. The exclusion criteria were pregnant women with cognitive or auditory deficiency. All the women were informed about the research, and were asked to sign an informed consent form. At the health clinics included in the study, the doctors were also interviewed to find out whether they prescribed medications and/or supplements that contained folic acid, in cases where the women did not know. They were also informed about the study and asked to sign an informed consent form. A questionnaire was used to gather socioeconomic data and information about folic acid supplementation, which had previously been tested and adjusted after a pilot study. The questions were asked by trained interviewers, who were supervised by a field coordinator. Whenever possible, the women were approached when they attended their prenatal group visits, which took place every month at the clinic, or by individual appointments. Demographic and socioeconomic data were collected, as well as information on the women’s participation in social welfare programs. Data were also gathered on the current pregnancy and the prenatal care received, as well as the women’s familiarity with and use of folic acid supplementation. To assess their folate intake, we employed a food frequency questionnaire (FFQ), adapted to the population group and nutrient evaluated, which had already been used in a previous research (16). It was used to obtain data on habitual diet during pregnancy, and presented options about the frequency of consumption of a number of selected foods. The 76 food items on the list were presented in standard portions, using household measurements or individual units, to calculate the quantities consumed. In order to estimate daily intake, the stated frequencies of the foods consumed were converted into their daily folate equivalent. To determine the portions consumed or the size of a household portion from the food frequency questionnaire (FFQ) in grams (g) or milliliters (ml), a table for evaluating food consumption in household measurements was used (17). The quantity of folate in μg was calculated for each of the 76 food items listed. The food composition table published by Instituto Brasileiro de Geografia e Estatística (18) was used to obtain the nutritional composition of the foods. A second food composition table (19) was consulted when one of the foods on the FFQ or some food under investigation was not contained on the TCA/IBGE table. Finally, the nutritional information on the packaging of the foods consumed was consulted to fill any remaining information gaps. Nutritional labelling is mandatory in all manufactures foods in Brazil. In order to verify the adequacy of folate intake during pregnancy, the Institute of Medicine’s recommended dietary allowance (RDA) of 600 μg folate was used (9). We also adopted proposal of classifying 60% of the recommended daily intake as low and 61% to 100% as intermediate (20). Also, drawing on the work of Fonseca and collaborators (12), intake was divided into three categories: less than 360 μg/day (<60% of RDA), 360 μg to 599 μg/day (61% to 99% of RDA), and 600 μg/day or more (100% or more of RDA). We also ascertained whether the intake values obtained from food fortification reached the tolerable upper intake level (UL). The folic acid values from fortified foods and supplements were converted into dietary folate equivalent (DFE), since the bioavailability of folic acid is greater than the folate from unfortified foods. As such, 1 DFE was taken as corresponding to 0.6 μg folic acid from fortified foods and/or supplements consumed with food, and was the equivalent of 1 μg food folate (9). The pregnant women’s use of vitamin supplements was also checked. To estimate the quantity of folic acid in the supplements, the method recommended by of Fonseca and collaborators (12) was adopted, which assumes a daily intake of 400 μg of folic acid, the dose recommended for pregnant women and normally found in vitamin supplements. The data were subject to statistical analysis with Epiinfo (2007) software package (21). In the case of the continuous variables, such as age and food consumption, the means, medians and standard deviation were calculated. When necessary, the averages were compared using ANOVA with the Origin 6.0 software package (Microcal Software Inc.). For the categorical variables, the frequencies, standard deviation and 95% confidence intervals were calculated, and for the association tests, when appropriate, the prevalence ratio (PR) was calculated, considering a 95% confidence limit. The project was submitted to the ethics committee of the State University of Montes Claros (Universidade Estadual de Montes Claros, UNIMONTES) and approved under protocol no. 3094. Interviews were conducted with 492 pregnant women in the last trimester of pregnancy who were receiving prenatal care at the basic health units under study, all run by the public health service (SUS), in 15 municipalities in Vale do Jequitinhonha, Brazil. The average age of the pregnant women studied was 25.3 (SD= 6.2 years); the youngest was 13 and the oldest was 43; there were 20.3% of adolescent mothers. Most of the women declared to have brown or black skin (78.6%) and lived with a partner (72.3%); 32.7% of women reached only primary education. The majority of the women had a household income of up to one minimum wage (66.7%). The mean household income was 1.44 times the minimum wage. 45.7% of the women received the federal government’s conditional cash transfer benefit, “Bolsa Família”, and the average length of participation in this program was 3.7 years (Table 1). 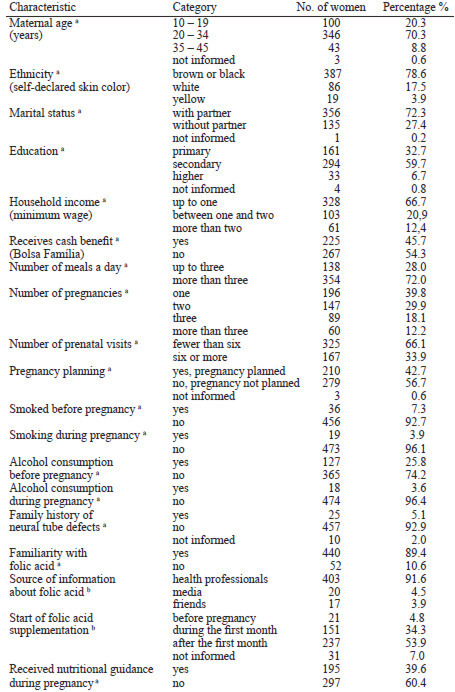 TABLE 1: Characteristics of the pregnant women included in the study, who received healthcare at basic health units run by the Brazilian public health service. Vale do Jequitinhonha, Brazil, 2013. It was the first pregnancy for 39.8% of the women interviewed, and 66.1% of the women had had fewer than six prenatal visits (Table 1). Most of the women (92.7%) did not smoke before getting pregnant, and 96.1% were not smoking while they were pregnant. 74.3% of the women said they did not drink alcohol before they got pregnant, and 96.5% said they did not drink during pregnancy. Concerning micronutrient supplementation, the vast majority said they heard of folic acid supplements from health professionals. However, only 4.8% started supplementation before becoming pregnant, 34.3% during the first month of pregnancy and 53.9% said they started later (Table 1). The women mentioned other supplements they used, which included ferrous sulfate (67.1%) and multivitamins (2.6%). Around 40.0% of the women (n=195) had received nutritional guidance from health professionals, 150 (76.3%) of these during pregnancy, most (80.0%) with the aim of ensuring a healthy pregnancy. The others said they had received nutritional guidance in order to help them lose (6.7%) or gain (7.7%) weight, or for other motives (4.6%). Two of the women were unable to answer these questions (1.0%). According to the food frequency questionnaire (FFQ), the pregnant women’s average folate intake was 609.1 μg/DFE/day, with a standard deviation of 419.5 μg/DFE/day. As for the tolerable upper intake level (UL) of folate, which is based on the concentration of folic acid from food fortification or supplements, it was found that 91 of the women (18.4%) reached the UL for folic acid, which is 1,000 μg. However, the prevalence of insufficient folate intake (below the RDA of 600 μg) was found to be 94.7%, considering only food folate, without fortification. This figure dropped to 49.2% after inclusion of the fortified foods the women ingested, and 17.1% when their diet as a whole was taken, plus supplement use (Table 2). TABLE 2: Origin of folate consumed and prevalence of inadequate folate intake according to socioeconomic and pregnancy-related factors. Vale do Jequitinhonha, 2013. 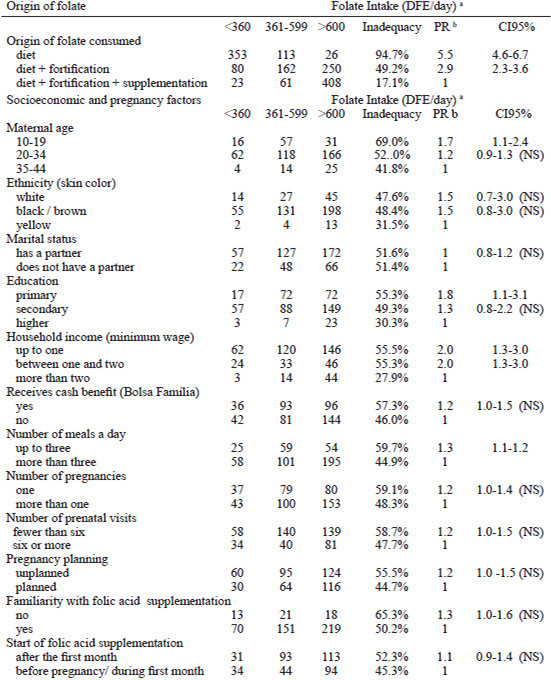 Some socioeconomic and pregnancy factors associated with a low folate intake (Table 2) were lower educational level (PR=1.8 [CI95% 1.1-3.1]), low household income (PR=2.0 [CI95% 1.3-3.0]), teenage mothers (PR 1.7 [CI95% 1.1-2.4]) and few meals per day (PR=1.3[CI95% 1.1-1.2]). According to the FFQ, all the women in the sample consumed foods containing wheat flour, maize flour and their derivatives fortified with folic acid. Table 3 shows the average folate consumed per food source, both fortified and not. The most widely consumed fortified foods were pasta (median 64.6 μg/DFE/day), “French bread” (white bread rolls) and sliced bread (median 40.7 μg/DFE/day), savory pastries (median 18.9 μg/DFE/day) and cake (median 7.1 μg/DFE/day). The most consumed unfortified food sources of folate were beans (median 151.6 μg/DFE/day), oranges (median 20.6 μg/DFE/day), milk (median 12.5 μg/DFE/day) and fruit juice (median 9.6 μg/DFE/day). The prevalence of inadequate folate intake encountered in the study was 94.7%, considering only the natural food sources of folate, without taking food fortification into account. A study in Rio de Janeiro found a prevalence of 63.6% inadequate folate intake (11). Two other Brazilian studies have reported prevalence of inadequate folate intake of between 50% and 80% (12). The largest study published on the consumption of folate by pregnant women in Brazil involved 1,180 adolescents from the municipality of Rio de Janeiro and the inadequacy reached 75.0% (13). The higher prevalence of insufficient folate intake encountered in this study could be attributed to the characteristics of the area under study, which has one of the lowest socio-economic levels in the country. One of the clear indicators of the degree of poverty in the region is the fact that the most of the pregnant women were living in households that had an income of up to one minimum wage. This degree of economic hardship is normally associated with greater difficulty in maintaining a balanced diet (22). Another indicator is the fact that almost half the women received the federal government’s conditional cash transfer benefit, “Bolsa Família”, with most of them having been on this benefit for an average of 3.7 years. When the folate from fortified foods was considered, the prevalence of inadequacy dropped to 49.2% of the pregnant women. Similar results were found by Pereira (16), who reported a 51.9% prevalence of insufficient folate intake amongst pregnant women, even taking into account their consumption of foods fortified with folic acid. Finally, the prevalence of inadequacy dropped to 17.1% when folate intake was calculated by adding the folate from food, from fortified foods and from supplements. These results indicate there have been some positive changes since the introduction of mandatory fortification of wheat and maize flour with folic acid in 2002 (10), in that the prevalence of inadequate folate intake is lower than it would be, without the consumption of fortified foods. Adolescence was the age group found to have the highest prevalence of insufficient folate intake: twice higher than the women over 35 years of age. A similar pattern was observed by Mezzomo et al. (1), who found that young mothers (aged under 23) were more susceptible to folate deficiency and therefore presented a higher risk of neural tube defects. Despite the higher folate requirement amongst this age group, because of the pace of cell growth and development, their eating habits are poor, and they do not consume much in the way of fruit and vegetables (14). Low income seems to be a risk factor for low folate intake during pregnancy, as well as having fewer meals a day. This could be explained by the women’s limited financial means, making it hard for them to buy food, so their diets are poor and their access to the most basic means of subsistence at such a delicate stage of life as pregnancy is restricted (22). As for education, this study points to a higher prevalence of folate intake below the RDA in pregnant women with a lower educational primary level, corroborating the findings of Lima et al. (11). Less schooling implies less access to information, lower income, and consequently more limited access to food and fewer communication resources, hampering access to health services. Education influences a person’s understanding of food and nutrition, which has an impact on their food preferences and their habitual diet (14). The prevalence of inadequate folate intake was higher for the women who had not planned their pregnancy and who said they had not heard of folic acid. These data reinforce the importance of raising awareness amongst pregnant women about the importance of improving their diet before and during the first weeks of pregnancy and getting periodic check-ups. In this study the vast majority of the pregnant women took supplements that contained folic acid. However, over half started this supplementation after the recommended period, thereby limiting its protective effect against neural tube defects caused by the closing of the embryonic neural tube around the 22nd to 28th day after conception (5). The small percentage of the women who took periconceptional folate was also significant: just 4.8% took the supplement before pregnancy, which is similar to the findings of a previous study by Mezzomo et al. (1), who found this prevalence to be 4.3%. In developed countries, studies indicate that around 40% of pregnant women use periconceptional folic acid supplements (23-24). This shows the importance of adopting measures such as food fortification, which increase folic acid intake not just before and during pregnancy, but in women of childbearing age, serving as a kind of universal supplementation. This study findings indicate there is a strong correlation between socio-economic factors and insufficient folate intake. The fortified foods found to contribute to the folate intake of the pregnant women from Vale do Jequitinhonha were pasta, white bread rolls and sliced bread. This shows that fortifying foods with folic acid is an important measure for preventing NTDs in Brazil, especially in poor regions like Vale do Jequitinhonha. We conclude that fortifying foods with folic acid at the current levels reduces the inadequacy of folate intake in the diet, but not enough to assure safe and adequate levels and meet the nutritional requirements of pregnant women in Brazil. We thank the financial support from the National Research Council (CNPq), Brazil, contract number: 481364/2011. Mezzomo CLS, Garcias GL, Sclowitz ML, Sclowitz IT, Brum CB, Fontana T, et al. Prevenção de defeitos do tubo neural: prevalência do uso da suplementação de ácido fólico e fatores associados em gestantes na cidade de Pelotas, Rio Grande do Sul, Brasil. Cad Saúde Pública 2007; 23:2716-26. Vitolo MR. Nutrição: da gestação à adolescência. Rio de Janeiro: Reichmann & Affonso Editores; 2003. Torrens C, Brawley L, Anthony, FW, Dance, CS, Dunn R, Jackson AA, Poston L, Hanson MA. Folate Supplementation During Pregnancy Improves Offspring Cardiovascular Dysfunction Induced by Protein Restriction. Hypertension. 2006; 47: 982-987. Kondo A, Kamihira O, Ozawa, H. Neural tube defects: Prevalence, etiology and prevention. Int J Urol. 2009; 16:49–57. Grillo E, Silva RJM. Defeitos de tubo neural e hidrocefalia congênita: porque conhecer as suas prevalências? J Pediatr (Rio de J) 2003; 79:105-6. Pulikkunnel ST, Thomas SV. Neural Tube Defects: Pathogenesis and Folate Metabolism. JAPI. 2005; 53: 127-135. Safi J, Joyeux L, Chalouhi GE: Periconceptional folate deficiency and implications in neural tube defects. J Pregnancy 2012, 2012:295083. Centers for Disease Control and Prevention. Recommendations for the use of folic acid to reduce the number of case of spina bifida and other neural defects. MMWR Recomm Rep 1992; 41(RR-14):1-7. Institute of Medicine. Dietary reference intakes for thiamin, riboflavin, niacin, vitamin B6, folate, vitamin B12, pantothenic acid, biotin and coline. Washington DC: National Academy Press; 2000. Brasil. Ministério da Saúde (2002). Agência Nacional de Vigilância Sanitária - ANVISA. Resolução - RDC nº 344, de 13 de dezembro de 2002. Diário Oficial [da] República Federativa do Brasil, Brasília, DF. Available: http://www.anvisa.gov.br/legis/resol/2002/344_02rdc.html. Accessed 15 June 2014. Lima HT, Saunders C, Ramalho A. Ingestão dietética de folato em gestantes do município do Rio de Janeiro. Rev Bras Saúde Matern Infant 2002; 2: 303-11. Fonseca VM, Sichieri R, Basílio L, Ribeiro LVC. Consumo de folato em gestantes de um hospital público do Rio de Janeiro. Rev Bras Epidemiol 2003; 6:319-27. Barros DC, Pereira RA, Gama SGN, Leal MC. O consumo alimentar de gestantes adolescentes no Município do Rio de Janeiro. Cad Saúde Pública. 2004; 20(1:S121-9):121-9. Azevedo DV, sampaio HAC. Consumo alimentar de gestantes adolescentes atendidas em serviço de assistência pré-natal. Rev Nutr. 2003; 16:273-80. Brasil. Ministério da Saúde (2010) Proporção de partos hospitalares, Brasil 2010. Available: http://tabnet.datasus.gov.br/cgi/deftohtm.exe?idb2012/f07.def. Accessed 15 June 2013. Pereira MZ. Consumo alimentar em gestantes e os possíveis efeitos da fortificação obrigatória de farinhas com ácido fólico na ocorrência de defeitos de tubo neural no Distrito Federal.2007. 122 f. Dissertação (Mestrado em Nutrição Humana) - Universidade de Brasília, Brasília, 2007. Pinheiro ABV, Lacerda EMA, Benzecry EH, Gomes MCS, Costa VM. Tabela para avaliação de consumo alimentar em medidas caseiras. São Paulo: Editora Atheneu; 2004. Instituto Brasileiro de Geografia e Estatística (IBGE). Pesquisa de orçamentos Familiares. Tabela de Composição Nutricional dos Alimentos Consumidos no Brasil. Rio de Janeiro: IBGE; 2011. Philippi ST. Tabela de Composição de Alimentos: suporte para decisão nutricional. 2. ed. Brasília: Editora Gráfica Coronário, 2002; 1:135 p.
Scholl TO, Hediger ML, Scholl JI, Khoo CS, Fisher RL. Dietary and serum folate: their influence on the outcome of pregnancy. Am J Clin Nutr 1996; 63:520-5. Epi Info (TM) [computer program] Version 3.4. Database and statistics software for public health professionals. Centers for Disease Control and Prevention (CDC), 2007. Fisberg RM, Marchioni DML, Cardoso MRA. Estado nutricional e fatores associados ao déficit de crescimento de crianças frequentadoras de creches públicas do Município de São Paulo, Brasil. Cad. Saúde Pública. 2004; 20(3): 812-817. Feldkamp M, Friedrichs M, Marti K. Folic acid awareness, Knowledge, and consumption among women of childbearing age in Utah, 1998-2000. Am J Med Genet. 2002; 107:67-69. Jong-Van Den Berg LT; Hernandez-Diaz, S; Werler M.M; Louik C; Mitchell AA. Trends and predictors of folic acid awareness and periconceptional use in pregnant women. Am J Obstet Gynecol. 2005; 192:121-8.